His winning word was "infinity" – and now he will compete beyond Ocracoke! 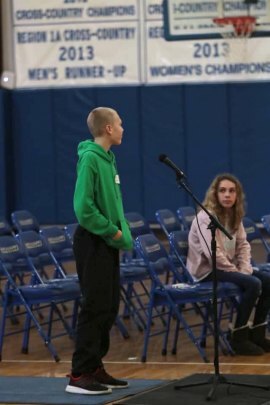 Twenty-three students in grades 4–8 competed at yesterday's Spelling Bee, standing up in front of the entire student body and a lot of parents to spell out loud. (Spelling on paper is so much easier!) Gabriel outlasted and outspelled them all through ten rounds. 7th grader Elsie Kattenburg is runner-up, with 8th grader Iris McClain taking 3rd place. 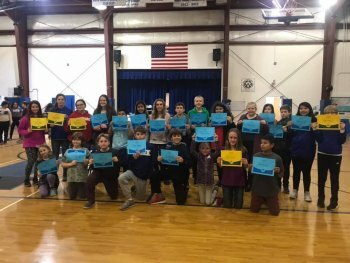 This was the first Spelling Bee at Ocracoke School since 2013; the event was revived this year by 5th grade teacher Jeanie Owens. High School English teacher Charles Temple served as the pronouncer, and teachers Susan O'Neal, Shea Youell, and Michael Shoemaker acted as judges. The spellers were competing for the chance to represent Ocracoke School in the regional Spelling Bee on March 16th in "lil" Washington, NC. 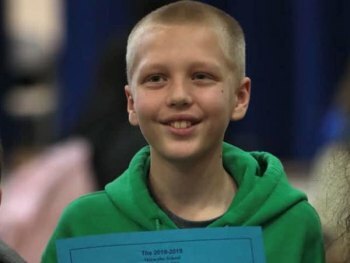 That competition, sponsored by the Washington Daily News, usually goes 10–15 rounds and the champion wins a trip to "big" Washington (D.C.) to compete in the Scripps National Spelling Bee. "I was really nervous," Gabriel said about the Bee. (It didn't show.) The audience could see that he moved his fingers while spelling. Why? He was imagining typing the word. (That's just the kind of strategy that Spelling Bee champs use.) He agreed that he's excited to go represent the Dolphins at the regional bee on March 16th.